Sylvia Durrant found her calling when she replied to an advert for an SPCA bird rescue volunteer. Sylvia’s previous career as a nurse had prepared her for this life-saving work with birds and educating the community. She is an inspiration, as I found out when I had the pleasure of meeting her. White hair swept off her face and gold-rimmed glasses perched on her nose, Sylvia Durrant, known as the ‘bird lady’, greets me with her generous smile. At once, she engages me in animated conversation about birds and the patients in her care today. Sylvia has been caring for sick and injured birds on Auckland’s North Shore for the past twenty years, since she responded to a newspaper advert asking for volunteers to care for baby blackbirds. Sylvia knew little about birds then but as a retired nurse caring for her disabled husband, she had plenty of time on her hands. I first met Sylvia in 2006. My daughter started helping her for a few hours each week and would return full of enthusiasm, re-telling Sylvia’s stories. A bird enthusiast myself, I couldn’t wait to meet her. Sylvia left a deep imprint then and on other occasions when I had the pleasure of seeing her at work. I remain in awe of a modest lady with boundless energy and enthusiasm, even as she struts towards eighty. Sylvia lives in a small house on a quiet street in North Shore’s Rothesay Bay. One side of her house is lined with bird cages of varying sizes with plastic covers ready for the Auckland downpours. At the back is the blue penguin enclosure, covered to replicate the darkness of a natural burrow. Step inside Sylvia’s side entrance and in her laundry room you’ll find needy birds housed in rows of cages lined with off-cuts of sheets or towels. In the sink, a pile of bowls and small pipettes wait to be washed. Residents at any time may include natives such as the tui, wood pigeon, kingfisher, fantail, silver-eye, and Sylvia’s favourite, the blue penguin. Swallows, sparrows, blackbirds and ducklings are also frequent patients, as well as the less common petrel, morepork, pukeko, and Australasian gannet. Step through the garage into the hall and first right is the nursery for baby birds. Here Sylvia’s patients are tiny and fragile, some only days old, featherless and eyes closed. They snuggle in small baskets lined with paper towels and covered with cloth to keep them warm. A donated incubator is on hand for emergencies. During the breeding season from September to February, Sylvia can have up to a hundred and fifty birds; many are babies and she can work fourteen hours a day, seven days a week. Sylvia shows me her kitchen where she prepares meals – chicken mash, beef strips, egg yolk, green peas, as well as chopped fruit and sugar water for the nectar lovers. She disappears momentarily – another bird has arrived. She reappears, hands cupped underneath her broad grin, “Another sparrow,” she says with childlike excitement. Feeding the penguins is a no-nonsense affair. Sylvia kneels in the enclosure, a penguin gripped between her knees as she pops a succession of sprats in his beak. Hungry penguins can eat an astonishing $300 to $500 (4) of fish each week. As she returns to the nursery, I comment on her energy and she throws her head back and laughs as she recounts an amusing story. Two boys found a bird and one suggested taking it to the ‘bird lady’. “’Is she still alive?’ the other asked. I’ve been around for so long you see“ (2). Then she skips across the room to catch an escapee with the nimbleness of a woman a fraction of her age before deftly holding three chicks at once to feed them with a pipette. The birds are not Sylvia’s only companions. Her dog Misty is a “bird-dog” having been trained to help, particularly when the blue penguins have their swim. Take an early morning walk on Rothesay Bay beach, and you may see Sylvia and Misty encouraging their convalescing patients out of the carriers onto the rocks. The “little blues” (2) are unsure at first but are soon diving into the clear salty water that shimmers in the early morning sunlight. Sylvia and Misty look on and seem to enjoy the solitude. The rock pools provide a safe swimming hole, and if a penguin gets out before the end of the session to go for a wander, Misty gently licks it and it dives back into the water. Sadly, blue penguins are ‘near threatened’ (6) and many become road victims when they come ashore at dusk to return to their nest sites in rocky burrows. Having glimpsed hundreds of these little birds swim ashore at Oamaru on the South Island and clamber up the rocks, the work of volunteers like Sylvia is brought into focus. Helping to keep up penguin numbers for breeding is so important for the long-term survival of the species. Sylvia doesn’t get attached to the birds. Too much human contact wouldn’t prepare them for the wild and the release is the most important part, she says. But she’s not immune to the emotional response when releasing a bird; “everybody has a very good feeling for releasing birds” (1). She recalls another story – about a man from Kaukapakapa who brought in a wood pigeon that had flown into a window and broken a wing. “It took about three months to heal… and he’d ring me every week and say ’his mate comes and sits in the tree every day at the same time, its waiting’” (1). When the bird had recovered, the man released it and the next day he rang Sylvia. “’It was wonderful’ he said, ‘I got home, opened the box and it flew straight up into that tree and they flew off in a pair’, and he was really almost close to tears with delight that this had happened” (1). Another man releases petrels for her, collecting them on his way home from work. His wife says the best pleasure for him is to release these birds and see them flying away. “And that’s the most important thing because they’re wild birds… and they need to go back,” (1) Sylvia re-iterates, her smile replaced by a seriousness that demands my understanding. It’s not always a pleasure though. In April 2006, a rare mass starvation of blue penguins along the Hauraki coast resulted in Sylvia caring for 140 sick birds in early summer compared to around 30 usually (7). Dogs off the leash can cause irreparable damage, but when asked what is the biggest problem facing local birds, Sylvia is in no doubt, “Cats, cats, cats and more cats“(1). New Zealanders are fond of their cats but they can have a serious impact on bird populations in the breeding season when chicks are vulnerable. Sylvia has prepared an information sheet which she hands out to responsible cat owners (9). She is keen to help with education and is a regular speaker at Forest & Bird meetings, brownie groups and schools. Sometimes she takes along an ambassador if she has one – a penguin with injuries that would severely reduce its chances of survival in the wild, temporarily adopted until it can be re-homed in a zoo. The most challenging part of Sylvia’s work is dealing with injuries because veterinarians don’t usually treat wild birds. She had a blue penguin with a deep gash across its back and the vet said it was impossible to stitch. “I got all the sand out of the wound… I put aloe vera jelly on it to heal it and just put a few zig-zag stitches in it to hold it so that when she moved, her back muscles wouldn’t just tear it again and then I bandaged her up, sent her swimming every day and it healed. Took three months but it healed… So that’s something else I learned, you see” (1). Sylvia is accustomed to overcoming obstacles. In 2006, a tired, hungry albatross was found in Silverdale, way off course from the Southern Ocean. Sylvia fattened him up with fish easily enough, but releasing this enormous bird was problematic. She was aware that an albatross needs either a very high cliff or very high seas to launch from. “I rang a few fishing companies and asked, ‘have you got a boat going down to the Southern Ocean any time soon?’ And eventually, I found one that was leaving from Nelson.” Sylvia asked DOC if they could take the bird to Nelson, but they told her to put the bird out in the harbour. “The harbour’s not the place for an albatross, the Southern Ocean’s where he belongs,” (1) she told them but they were uncooperative. Determined to give the albatross the best chance of survival, Sylvia rang Bill Hohepa, “the Maori fishing guy” (1) she had just seen on television. He said a storm was coming and that the coast guard at Browns Bay could take the albatross out past Rangitoto Island where the seas would be very high. “Luckily the albatross was able to paddle up to the top of a huge wave, turn round and run down that wave and up the other side before taking off into the sky.“ Sylvia was very excited by that release, “there was a picture of him in the paper and when I stood up and held the bird, his one wing touched the floor and he was so beautiful. I loved having him” (1). Sylvia isn’t shy in voicing her opinion and she doesn’t seem to worry what people think about her as long as they listen. She recalls an incident where she wanted to educate gardeners about growing the sticky para para, or bird batcher tree, in their gardens. Sylvia took three little wax-eyes, “all messed up from being caught in that tree,” to a garden club. “‘Now all you people with gardens…’“ (1). Sylvia’s manner reveals a woman who cares deeply about birds and wants to share her knowledge. She is matter of fact, “New Zealand only has birds. We don’t have anything else so we have to protect the habitat of birds. And the only way to get this across is to talk to people” (1). In June 2007, Sylvia received national recognition when she was awarded the Queen’s Service Medal for services to wildlife. She accepted the award as recognition for all the bird rescue volunteers. Locals who have visited her Rothesay Bay home may not recognise her in the photograph receiving her medal from the Governor-General (8). She doesn’t have a bird in her hands! Sylvia has appeared on television and in the North Shore Times, and although she doesn’t seek personal fame, she is aware of the benefits of public exposure. “I don’t mind how many times I’m interviewed or put in the paper because it’s spreading the word” (1). Sylvia certainly has a growing congregation. Based on the original article written in 2012. 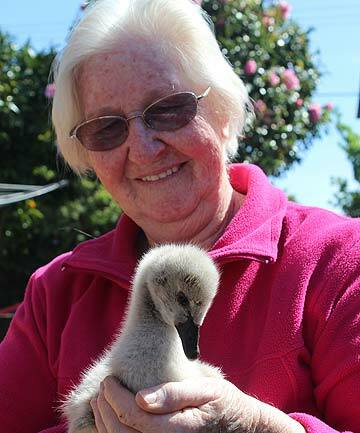 Update Feb 2017: Sylvia is now in her 80’s and still caring for birds in her home on Auckland’s North Shore! Update Jul 2018: Aged 85, Sylvia has now retired on her doctor’s advice. This much-loved compassionate and unique lady will be missed on Auckland’s North Shore. Although she will no longer take in sick and injured birds, she will still visit schools to inspire children to care about nature. She is counting on the Department of Conservation to do more for injured wildlife. News article here. Alex Brighten, recorded interview with Sylvia Durrant, June 2007. Tracy Brighten, conversations with Sylvia Durrant, November 2006, December 2007, December 2008, March 2009, February 2010. ← Should we care about future generations?